People using screen readers or other assistive technology require an association between data cells and corresponding header cells in order to understand the structure of tables. Ensure that the structure of tables, including header information, is properly defined so that people with a visual impairment can read the table using assistive technology devices such as a screen reader. Set the type of the table selected by CommonLook Office by clicking on one of the displayed icons and perform the appropriate processing based on the type: Presentation, Column Headers, Row and Column Headers or Others. Click All Presentation if all the tables in the document are used for layout purposes (there are no data tables in the document). Click Next to move to the next table. Repeat until you have set the type of all the listed tables. Check “Generate Speak Text” to simulate table structure for users with assistive technology that does not understand table tags in PDF. ADVISORY: Speak Text may have the effect of making the table less useful to users with PDF-friendly assistive technology that can leverage table structures in PDF files. For this reason, it is recommended that Speak Text is generated only if required to support devices or software that do not fully process table structures in PDF. NOTE: Click Reload if you modify the Word document to ensure CommonLook Office updates the the document structure. No settings are required for Presentation tables as this table type is used solely to format the layout of document content (e.g. to create a column effect). 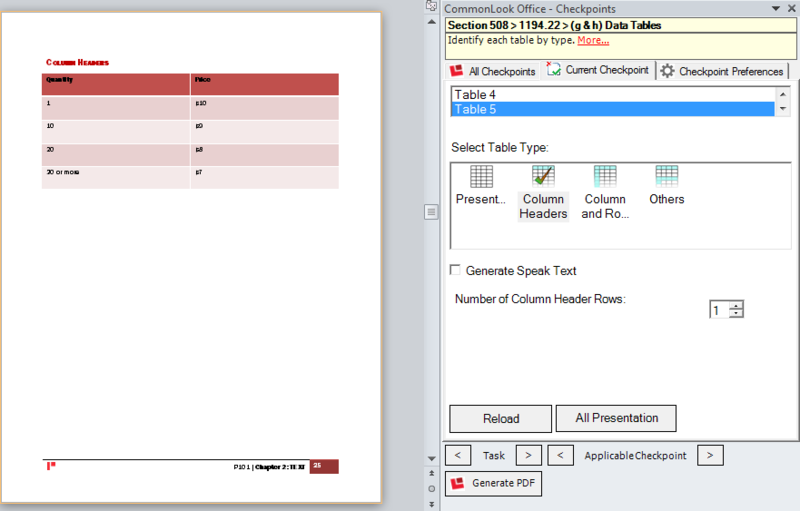 No table structure will be created in PDF for presentation tables. Tip: Consider using an approach other than a table to create the appropriate layout effect in Word (e.g., by using columns in Word) in order to improve the accessibility of the Word document. This is the most basic and common type of data tables. The top row of the table contains the headers of the data cells in subsequent rows. The top row(s) of the table contain the headers of the columns in the rows of data below the headers. The leftmost column(s) contain the headers of the rows in the columns of data to the right of the headers. This table type makes it possible to specify the structure of highly complex tables where the link between headers and data cells cannot be automatically determined from the layout of the table using simple rules.